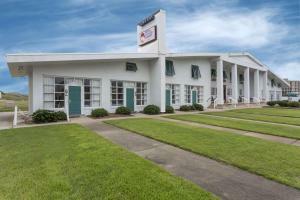 The Quality Inn Carolina Oceanfront is located on North Carolina's Outer Banks, directly in front of the breath-taking Atlantic Ocean and across the street from the Wright Brothers National Memorial. This hotel is just minutes from area attractions, like the Nags Head Fishing Pier, North Carolina Aquarium, Fort Raleigh National Historic Site and Avalon Fishing Pier. North Carolina's Outer Banks area is home to many beaches. Additional attractions nearby include the Oregon Inlet Fishing Center, Cape Hatteras National Seashore, Bodie Island Lighthouse, Lost Colony outdoor drama show and Pirates Cove Marina. Only a quick drive away is Albemarle Sound, which is perfect for sailing, boating, jet skiing and fishing. Enjoy hang gliding at Jockey's Ridge State Park. Golf courses, tennis courts, movie theaters and bicycle rentals are all located in the surrounding area. The hotel is close to a variety of shops, restaurants and cocktail lounges. This hotel offers many full-service amenities, including free hot breakfast, free wireless high-speed Internet access, free weekday newspaper, free local calls and free coffee in the lobby. Guests of this hotel can are also invited to take a swim and relax in the seasonal outdoor pool. A public computer with Internet access, and access to copy and fax services are available for corporate travelers. All spacious guest rooms feature pillow-top mattresses, microwaves, refrigerators, coffee makers, irons, ironing boards, curved shower rods, hair dryers, voice mail and cable television with free Showtime. For added convenience, coin-operated laundry facilities are located on the premises. Ample free parking is provided and can accommodate most vehicles. When would you like to stay at Quality Inn Carolina Oceanfront ? This accessible room features cable TV and coffee-making facilities. This room features a cable TV and coffee-making facilities. A sofa bed is also included. This double room has a balcony, tea/coffee maker and flat-screen TV. This double room features a tea/coffee maker, sofa and private pool. Guests are required to show a photo identification and credit card upon check-in. Please note that all Special Requests are subject to availability and additional charges may apply. Swimming pool is closed from Mon 01 Oct 2018 until Sat 20 Apr 2019 You must show a valid photo ID and credit card upon check-in. Each day we'll check prices and send you an email for your selected dates at Quality Inn Carolina Oceanfront. If you don't have specific dates but would like to check prices for say next weekend or say next month we can check the price too. Click to write a review and share your experience of Quality Inn Carolina Oceanfront with other travellers.